What a woman should do and what she should not do. How she should behave and how she should not behave. Who she should speak to and who she should not. What a woman should dress like and what she should not wear! Our society has already formed these social norms and rules for her. And as we speak about Marathawada, we know that these rules just get rigid further. Our work through Single Women’s issues campaign is going on in Osmanabad taluka. Ekal Mahila Sanghatana has been making continuous efforts so that single women residing there become self-independent. These endeavours by Kanta Shinde - leader from Osmanabad, along with the elected committee proved fruitful when our women from Ekal Mahila Sanghatana were appointed at petrol pump to work there, for first time ever. They chose 8th March (International Women’s Day) as a day to begin this special journey. Despite facing immense constraints from family members and relatives, members of Ekal Mahila Sanghatana, Sujata Jakate, Ashwini Kamble and Sheetal Jakate in Osmanabad, were firm on breaking the norms and taking this decision by themselves. For the past 15 days, we have been monitoring this situation and talking to our women constantly. All three of them are single. (Women who have are widowed, abandoned, separated, or never married). When they were intimidated by their in-laws, organisation’s leaders submitted a legal document of the clashes with their in-laws to petrol pump owners, stating that the organisation firmly stands with them through all these struggles. To which, the petrol pump owners assured that no matter how much their families try to put political pressure on these women, they will face no trouble while working at the petrol pump. The word courage comes from the Latin ‘cor’, which means heart and refers to the ability to follow our heart. Our women are doing exactly same - ‘following their heart’, even if that means breaking stereotypes, prejudices and challenging patriarchal practices. This journey was never easy; it will never be. But these courageous women are now unstoppable. If this isn’t how we should celebrate Women’s Day then how to? 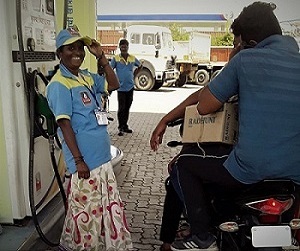 What is also worth mentioning is the role of petrol pump owners, Shriram Highway Services Vaibhav Umbre and Bharat Dhekne of Bharat Petroleum on Solapur - Dhule National Highway near Osmanabad by-pass, considering rural areas are highly male dominant and every attempt to challenge patriarchal mentality needs joint struggle by everyone in the society. We at CORO, truly wish to acknowledge this support bestowed by the pump owners. They have also been approached by other members of Ekal Mahila Sanghatana for livelihood opportunities. In our Single Women Issues campaign, we facilitate them to become leaders of social change, rather than victims of exploitation so that they can act as agents of social change in their own communities across the Beed, Latur, Osmanabad and Nanded districts of Marathwada, breaking stigmas associated with single women. By fighting for the rights and dignity of Single Women from inside the community, the campaign is radically changing the mindsets and behaviour of community members towards single women and of single women towards themselves.